Bring your garage into the 21st century with our newly redesigned, Performance Plus 2.0 Series; our first fully mobile, modular garage cabinet series yet. Each cabinet features fully welded, 18-Gauge steel frames with fully lockable double walled doors; that is 100% stronger than our Performance Series. We have included soft-close door hinges, adjustable steel shelving, full extension drawers, integrated top tool trays on your base and tool cabinets and many more premium features. Our newly designed Mobile Spacer Kit allows you to change your once static garage set into a fully functional mobile set; with included casters, your base and tool cabinets can now slide in and out of your set with ease, leaving your worktop stationed. 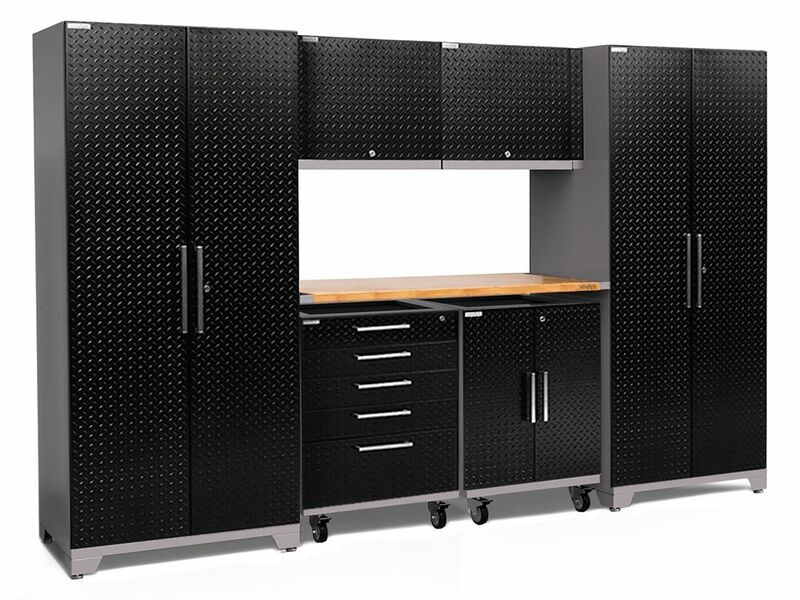 Performance Plus Diamond Plate 2.0 Garage Cabinet Set in Black (7-Piece) Bring your garage into the 21st century with our newly redesigned, Performance Plus 2.0 Series; our first fully mobile, modular garage cabinet series yet. Each cabinet features fully welded, 18-Gauge steel frames with fully lockable double walled doors; that is 100% stronger than our Performance Series. We have included soft-close door hinges, adjustable steel shelving, full extension drawers, integrated top tool trays on your base and tool cabinets and many more premium features. Our newly designed Mobile Spacer Kit allows you to change your once static garage set into a fully functional mobile set; with included casters, your base and tool cabinets can now slide in and out of your set with ease, leaving your worktop stationed. Performance Plus Diamond Plate 2.0 Garage Cabinet Set in Black (7-Piece) is rated 5.0 out of 5 by 4. Rated 5 out of 5 by thelovingwife from Love the NewAge Performance Plus line! High quality work station... Love the NewAge Performance Plus line! High quality work station for our garage. The perfect gift for my husband.